NBC Nightly News anchor Brian Williams flatly declared, "Tonight, the U.S. Justice Department says the sheriff and his deputies have gone too far. They have been systematically been violating the constitutional rights of Latinos." ABC's World News uncritically featured one of Arpaio's prisoners who hyperbolically insisted, "The food we eat is disgusting. It's more like a concentration camp than anything else." 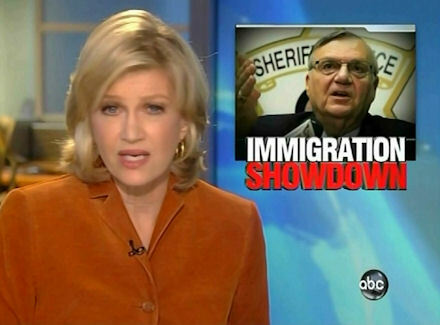 World News anchor Diane Sawyer rattled off the incendiary claims, parroting that Arpaio "was slammed today by the full force of the U.S. government, which said his office deployed abuse, retaliation and discrimination against Hispanics." She hyped, "All of it adding to the inflamed debate, is Sheriff Joe Arpaio a champion or a bully?" In the ABC piece, Pierre Thomas only featured Arpaio defend himself, but in addition to the anonymous prisoner, also included Assistant Attorney General Thomas Perez claiming the sheriff "engages in racial profiling of Latinos and unlawfully stops, detains and arrests Latinos." He did allow that Arpaio is a "hero to hard-liners." Nightly News' segment included Perez and Thomas Saenz, President of the Mexican American Legal Defense and Education Fund, deriding, "I think that Joe Arpaio is a textbook example of how not to police consistent with the Constitution." BRIAN WILLIAMS: There is new trouble tonight for this country's best known sheriff, Joe Arpaio from Phoenix, Arizona, known for things like making prisoners wear pink underwear and putting them on chain gangs and more recently for his crackdown on illegal immigrants. Tonight, the U.S. Justice Department says the sheriff and his deputies have gone too far. They have been systematically been violating the constitutional rights of Latinos. We get more from NBC's George Lewis. GEORGE LEWIS: Sheriff Joe, as he's known in Phoenix, is famous for his periodic raids on high crime neighborhoods, including places that have a lot of Latino immigrants. JOE ARPAIO: This is our 17th crime suppression operation. LEWIS: His tactics have put him at odds with the Obama administration and today, in a sharply worded 22-page rebuke, the Justice Department said the Maricopa County Sheriff's Office, the MCSO, quote, "engages in a pattern or practice of unconstitutional policing," directed against Latinos. THOMAS PEREZ [ASSISTANT ATTORNEY GENERAL]: Law-abiding residents of Maricopa County who were caught up in the web of unconstitutional activity and unlawfully stopped, detained and sometimes arrested. LEWIS: The Justice Department said that in the Phoenix area, Latinos are four to nine times more likely to be stopped by deputies than non-Latinos. The Justice Department is giving the sheriff 60 days to change the way he does business. And if that doesn't happen, the department threatens to sue him. The Mexican-American Legal Defense and Education Fund, MALDEF, is already suing the Sheriff. THOMAS SAENZ [MALDEF PRESIDENT AND GENERAL COUNSEL]: I think that Joe Arpaio is a textbook example of how not to police consistent with the Constitution. LEWIS: The Sheriff has long accused the Obama administration of making him a scapegoat. ARPAIO: We do not racial profile. When they can't get you on anything else they throw up the race card. LEWIS: Late this evening, the sheriff called it a "sad day for America" as the Department of Homeland Security cancelled his authority to conduct immigration screenings in his county jail. George Lewis, NBC News, Los Angeles.